NO CHOCOLATE... I am GOING CRAZY! Kathryn was in the room with the door closed and her cat was crying to get in. Then she started jumping up at the door knob trying to turn it. It was pretty funny. I made these a long time ago and found them in my photo folder. I wanted to share. The secret to this one is to get a paddle and ball that ties not stapled like the old wood ones. I found this at the dollar tree. I put stick paper on it. I dont have a exact pattern. I traced it and scanned it about 95% and it seemed to work out just fine. some hershey miniture chocolate labels and some hershey nugget labels. I have a template for the miniture chocolates. 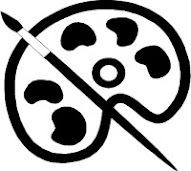 If you would like the template convo me at etsy. There is a link to the left. The secret to the nuggets are avery address labels. The perfect fit. If you are interesed in anythemed candy labels or candy boxes convo me on etsy. I think I can come up with something that might be of interested. I dont know about you folks, but I like to knit just to knit. I really dont care much about having a completed project. It took me a while to actually complete something. I found my inspiration on the Carol Duvall show. They had this funky purse that only took one ball of yarn, two hoops for handles and some lining. I made the flower with scrap yarn, probly the same yarn I used for that pink metalic yarn, with out the metalic. I found a button for the center of the flower. I was in the bed room and I came out and Carlos was trying to put the child proof gate back up in the kitchen. In this case it’s a dog proof gate. I stood there, dogs by my side and arms crossed. He said What? It was down when I came home. I told him well first you are putting the gate up on its side, also looking at down at the dogs, I said the dogs are on the wrong side of the gate. I then told him to forget putting it up. I love this yarn it reminds me of ribbon. Here are two scarfs I made out of and a small purse. There is a scarf that matches the purse but I do not know where Kathryn hid it. Probably in her car. The bottomless pit that it will never be seen again. Blue Scarf-- wider then the others I love the rich blue. Black and white scarf Black and white my fav. The little hand bag... I do not remember the name of the color but I love it! I want to make a wrap out of or the copper yarn. I have tons of that too. A lot of the incredible yarn was sold at the dollar store and every time I saw some I scooped it up. They still sell it at joannes full price. Go figure that one out. This is the one that there is a skinny scarf for but I dont have a picture for it. Still no Chocolate. Pretty amazing huh??? Conner said he was abnormal while he was showing off that his finger was double jointed. Here is the deal. After midnight I went to walmart to stake out the goodies. It was getting pretty wild already. People were staking out their goodies. They were lined up for the tvs and lap tops. I scoped all the items I wanted. I bought a few things and went home. I layed my head down a few hours. I went back at 3am and started piling my buggie with all the stuff I wanted. I walked around for a while and everybody was beginning to line up to check out. They were not checking out the till 5am. I was in line at 4am. So I had an hour to wait. Once it was 5am, I was out by 23 mins. I felt sorry for all them silly people who were coming in at 5am. All the stuff were already in the peoples buggies in line. I went home and didnt wake up till 2pm. The picture shown is when the scarf was a work in progress. It is completed now. It is so incredibly soft. I used two yarns. I think one was a jiffy yarn and one was a metallic fancy yarn. with the flash on or is it off I do not remember, it represents the colors better I think anyway. can you see the silver metalic???? Schools out Schools out teacher let the monkeys out. One went east, one went west and one went up the teachers dress. I played hookie from work too. Brian the Brain is a toy that you can program to talk and say a particular child’s name. Conner had one. Late one night Brian started calling Conner’s name while he was asleep. It scared the creepers out of him. He went to his mom’s room and told her Brian the Brain interrupted his sleep. Back at work. Monday Blues. Snickers is still calling me. Tim is licking 3-musketeer bars and offering it to me. Chick fil a still has tastie brownies... there are still two brownie mixes in the pantry and a box of white fudge covered oreos in the cat food. That is to keep them out of Carlo's reach. Its been a week and the tempations have been great! There was all you can eat ice cream and not wimpy vanilla either. There was mint chocolate chip, chocolate and cookies and cream. I said I will persevere... Mom said you hadnt had a head either. Well yes I have. My nephew gave me a chips ahoy cookie. I told him thank you. Then I offered him one. He said thank you. He smiled. There are now oreo cookies covered in white fudge in the house. Oh my! I will make it... I tell you! I went to get Lucas his Christmas gift and Conner went with me. He want to get Lucas a present too. He first wanted to get a coloring book but they only had the same one he already had. He then picked out a dora book. He was so proud of that book. He told every stranger that he had a present for his brother in the bag. I made this out of a straw wreath, fabric, glue and ornaments. I cut the fabric with pinking shears (so it wont unwravel as much) and put a dab of tacky craft glue on the wreath. Take a square of fabric and place the middle of the fabric over the glue. I took an old bent up knitting needle that I cannot use (if you dont have one try a screwdriver) and push the fabric into the wreath with the point of the knitting needle or what ever took you decide to use. Fill the whole wreath up. You dont have to fill the back of it up. Decorate with any oraments you desire. I actually sold this one at the flea market thanks to Nancy Yeah me I sold a craft! The snickers are calling my name! I told them they had the wrong number. I was tempted with cheese cake bites smothered with chocolate sauce. I said no. I was tempted with hershey nuggets. I said no. The days are dragging by. I think it is because I know next week is thanksgiving. I found more tempation. Mickey has mini reese cups. How cruel is that? 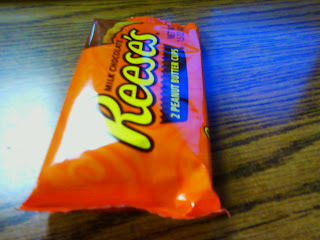 Since he stole Mark's butterfingers I stole his minie reese cups and passed them out. Oh the evil doings of an office. This blog thing is pretty cool. A long time ago I wanted to start a journal using the computer, this before any of those online things. I wanted to include pictures and the days going's on. So I made my first entry. The plan was to save it to a floppy disk. So I put my plan into action. The first entry was a master piece. I included witty comments and photos. When I was done I put a floppy disk into the computer and hit save. My wittiness must have been packed with some heavy stuff because the disk wasnt large enough to hold that one file. SPARTANBURG, S.C. – Call it udder shock. A South Carolina woman who heard a giant splash in her backyard discovered a 650-pound cow had fallen into her swimming pool. WSPA-TV reports that the cow fell into Kathy Wydareny's covered pool on Monday night. The Anderson resident says the cow belonged to her neighbor. OH the tempation... Last nite Joey put a bowl of chocolate ice cream right in front of my face and said here you can have that. I split it in half and gave it to Marlo and Sophia. I dreamt I ate Chocolate. I want to go to Chick fil a and I cant have a brownie! NO FAIR! Silly bet I made with myself! I put my yarn away for quite some time. I started watercolor painting and its got my attention. I found a new book in the libary about crochet. Maybe it will inspire me to pick up the yarn again. I know the kitty misses it. The dog found it under my bed. I am not happy with the dog right now. Day one of no Chocolate. Its going pretty rough. 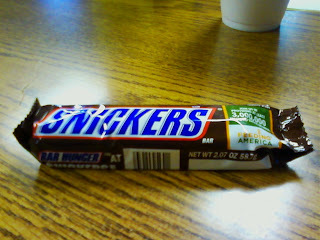 The snicker bars were just replinished in the snack machine. They are calling my name. I think I will be dreaming chocolate dreams tonight. Good thing Cheese Cake is not made of Chocolate... then I wouldnt be able to eat that piece of cheese cake Robin gave me. PS notice the time that this was posted... I did not change it! The evil snickers is even saved in my pics on my cell phone! They are every where! I told everybody this was my last bit of chocolate till Thanksgiving, almost two weeks away. We went to Charleston before Wendell went back to AZ. The people who went are Barbara, Bruce, Mom Wendell and Me. Wendell took over the radio of course. That is so irritating UGH! Not to mention his taste in music is BLAH! We went to Subway for lunch. Exciting yeah I know. Then we went to Folly Beach and hung out at Heather’s place for a while. She has a wonderful view. This is one of the trees that has cranes in it. Then we went to the beach and walked for a while. Heather and Mark looked for sea shells for a vase and I took pictures and was bossy. Then we went downtown Charleston. They had a ghost tour carriage ride but alas we were poor. For dinner we went to Tbonz. Bruce had his favorite Tommy fries. Then we walked thru a spooky Charleston. Wendell came to visit from Arizona. Barbara helped him to purchase a car. He flew in on Thursday and will be driving back on Sunday the 15th. Saturday we went to Phyllys's wedding Wendell went to Charleston by himself to see a movie at the imax theatre. I think he was crazy. Everybody else thinks I am crazy for thinking that is crazy. Just think if it ... how much did that movie cost? While I was in Anderson I had gotten a call from Sophia and Marlos mom asking me to come over but of course I couldnt. I called her the next day and invited them to go to the zoo with us. They were more then happy to join us. The people that went were Robin, Conner, Lucas, Mom, Wendell, Barbara, Bruce and of course me. All but Barbara and Bruce met at McDonalds for lunch. Poor Sophia and Marlo Could not remember Wendells name. Mom got the great idea of telling them to remember Window because it sounds like Wendell. They called him Window from that moment on and still calling him Window. Too Funny! The best part of this zoo visit??? The Penguins. They were hopping all over the place..
We saw the gorillas being fed. That was pretty cool. The meerkats were not as active and they usually are. Sophia insisted on seeing a sloth. I finally begged everybody to go see them so she would stop asking. We get there and well she didnt believe they were the sloths. I had her read the sign and then she believed me. I found out Kathryn was going to dinner with us at Olive Garden. I called Sophias and Marlo's mom and asked if they could go. I got the go ahead. I didnt tell them Kathryn was going to be there. I kept saying there was a surprise at Olive Garden. Sophia told me it was ok to tell... Barbara already did. Then she said Its ok to tell Conner told her. She is so silly! I assigned the seats so there was an empty seat in the middle and they asked who was sitting there. I told them your surprise. Sophia pretty much guessed what it was but I wouldnt confirm it! Even if his shirt says he doesnt bite... I bet he does!